In the Netherlands in the little town of Oldenzaal you can find talented watchmaking brothers, Bart and Tim Grönefeld. They aren’t just two guys toiling in the backwaters of a small country. These guys trained and then headed up departments at the renowned complications house Renaud & Papi. After 8 years of immersion training by the best, the brothers returned to their hometown and entered into the family business, where their grand-grandfather began his watchmaking career in 1912. Tim and Bart serviced timepieces but the challenge wasn’t enough. 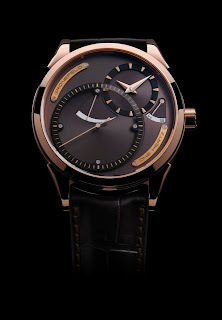 In 2008 they presented the exquisite yet very pricey GTM-06 Tourbillon Minute Repeater. Unfortunately the over 200K price tag scared off buyers due to the economy. 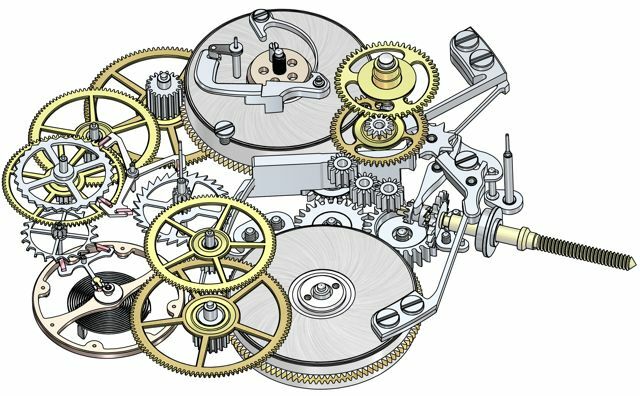 The Grönefelds knew that only a rarefied few could afford a tourbillon minute repeater so they decided to come up with something technically interesting yet affordable, relatively speaking. Hence, the completely in-house developed new movement, featuring a deadbeat seconds. No, deadbeat seconds, called secondes morte in French, won’t kill you. Clocks were the first to use this escapement. So what exactly does it mean? Instead of moving in a sweep, an emblematic sign of a mechanical movement, the seconds advance in true one-second steps. This is not easy to achieve, requiring an independent gear train, which also has its own power supply. In homage to pendulum clocks that enabled accuracy to the seconds, the brothers christened the watch One Hertz. A hertz, which means one cycle per second, is the SI unit of frequency defined as the number cycles per second of a periodic phenomenon. Though pocket watches have featured independent deadbeat seconds in the past, the One Hertz is the first wristwatch featuring independent deadbeat seconds. To highlight the inclusion of the mechanism, the seconds indicator takes up a large portion of the dial, with the hours and minutes offset at 2 o’clock. Mounted on pillars in the raised sapphire seconds dial is the power reserve indicator. 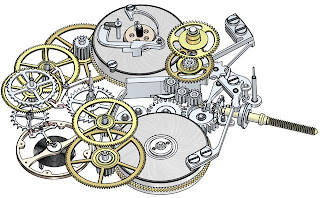 The setting/winding mechanism operates by pushing the crown rather than pulling it out. Flip over the watch and you can witness the brothers are all around players: from movement design and construction to finishing. Bart and Tim put a lot of thought not just into the movement layout and how the light would play over the hand-beveled bridges, but also into color contrasts. The red rubies and gold wheels and balance pop against the micro-blasted stainless steel movement. The brothers weren’t sure how the stainless steel would look, but as you can see, the choice was a good one. If you’re into movement aesthetics, this is a real jewel. Now the One Hertz is ready to be shown off at Basel next week. The “One Hertz 1912” in steel is offered in a limited edition of 12, while the “One Hertz Dune” is in red gold in an edition of 20. The steel model is 40K. I’m not sure of the retail price of the red gold, but add at least 10-15K onto the price. Either one is a real jewel. Indications: Hours and minutes in subdial at 2 o’clock, large seconds at 7 o’clock, power reserve, setting-winding indicator at 3 o’clock. Winding-Setting mechanism: Push function crown for winding or setting. Power reserve mechanism: Classic Breguet style by means of a cone moving up and down on the threaded barrel arbour. Case 1912: stainless steel, limited edition of 12 pieces, security screws, polished bezel and centre band with hand-finished straight graining. Case Dune: 18ct 5N rose gold, limited edition of 20 pieces, gold security screws, polished bezel and centre band with hand-finished straight graining. Sapphire crystals: top domed with antireflective treatment both sides, display back with antireflective treatment inside. Hands: Hours and minutes, long thin counter-poised seconds, power-reserve and setting-winding.